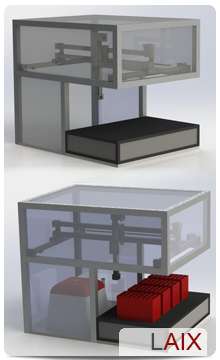 The new VariSam System has a modular design so that you can have customized automation at a standard price. The base is a high-quality aluminum frame fitted with a fast, smooth and precise linear system. Numerous options such as grippers, liquid-handling, temperature baths, operator protection and software can be added to complete the system for your application. You can watch a product-video here or on YouTube. 2 designs: VariSam comes with a flat base plate and the electrical mounted on the side, or with the electrical on the bottom and the side open for racks or other such installations. Custom-built sizes up to 1000x1700mm. The temperature dry baths are available in many sizes and variations and complement the VariSam autosamplers. All systems come with a Windows 2000/XP/7 driver, DLL Library, a test program and a programmer’s manual to help you adapt your own software. We have many years of experience in hardware and software. Or, if we can’t help you, we have a partner who is specialized in laboratory applications. Tell us what you need and we will make you an estimate. For standard applications, like SFC, we can provide standard software with complete automation systems.